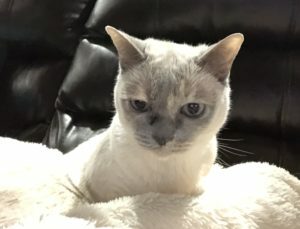 Holistic Support For Cats With Seasonal Allergies | Purrrfectly Holistic...a Boutique for Cats! Purrrfectly Holistic…a Boutique for Cats! Spring is here! The signs are all around us: trees blooming, warming weather, rain showers…and pollen everywhere! This is the time of year when everyone is suffering from allergies, especially humans. However, even cats can become sensitive to seasonal changes. 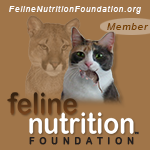 There are lots of ways to use a holistic approach to support cats with seasonal allergies. Integrative veterinarian, Dr. Karen Becker, finds that most pets’ symptoms of seasonal allergies show up as skin irritations, or allergic dermatitis. While it’s less common, some pets have respiratory symptoms that include sneezing, coughing, watery eyes, runny nose, and even nasal mucous drainage down the throat. When molds, tree, grass, and weed pollens are inhaled it can lead to sinusitis and bronchitis. If you notice these symptoms in your feline family members the first inclination is to go straight to the vet. Unfortunately, this often times ends up treating symptoms unsuccessfully by repressing the immune system. Feeling at a loss? I have a few suggestions to successfully address seasonal allergies for cats. Keeping your house as clean as possible by vacuuming, washing bedding and floors, dusting, etc. Coconut oil. Coconut oil contains lauric acid, which helps decrease the production of yeast. Using a fish body oil with coconut oil before inflammation flares up in your pet’s body can help moderate or even suppress the inflammatory response. We have two kitties are extremely sensitive to allergies in our household: Rocket and Lili. Rocket somehow developed quite a sensitivity over the past several years, probably from spending so much time in our outdoor courtyard. While he never had runny eyes, he did sneeze often and had a runny nose (out of one nostril only). These symptoms would come and go, and eventually created such an inflammatory response that a nasal polyp developed without us realizing it. You can read his story here. Lili’s only symptom has been watery eyes. Like Rocket, her symptoms would also come and go. As I look back I believe this is what ultimately caused her Epiphora, or brown tear stains. This condition is also an inflammatory response. Fast forward to present day. In the past several weeks as spring has begun to appear from a long, colder winter than normal, runny eyes, runny noses and sneezing are back. Determined not to have a repeat performance of past conditions, I have been very proactive. The first thing I do is muscle test to determine which allergen/s are causing the problem. These have included things like oak, hackberry, pine, soot, mold, and even particulate matter (from air polution). Next, I use an energy medicine technique to remove the body’s stress response to the allergen, and this allows the body to start the healing process. Finally, I muscle test again to determine if additional support is needed. 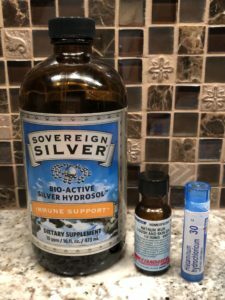 I’ve had great success using colloidal silver to boost the immune system, especially in Rocket. Just recently his running nose started to show signs of an infection! The colloidal silver knocked it out in just four days. Homeopathic remedies can also be used to affect a cure for seasonal allergies. There are many remedies that address symptoms like allergies, hay fever, sneezing, running nose, etc. However, once again, muscle testing is how to know which one your cat’s body needs. Nat Mur has stopped Rocket’s congestion, and Histaminum has successfully cleared up Lili’s watery eyes and Rocket’s running nose. Who knew it could be so easy?! While it’s great to be able to use supplements and preventative measures to remove allergens, I prefer to start by finding the cause. 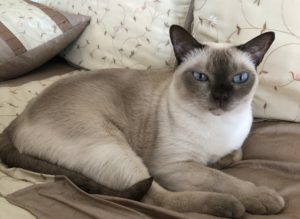 By far the most successful way to help your cat overcome allergies is to find out exactly what she’s allergic to first. Muscle testing takes the guess work out, and energy medicine can remove the stressor response. 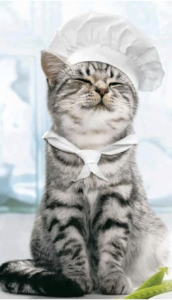 If needed, natural remedies and supplements can then be the final pieces of the puzzle in helping your cat’s body heal. Does your cat have seasonal allergies? Have you tried any holistic supportive measures? Share in the comments below!